Let the rhythm hit you, not the spikes. Geometry Dash Lite keeps the bass thumping and the adrenaline pumping as you jump and slide your way through danger in this rythm-based action platformer. We've all played tap based games on our mobile devices, but have you played one that requires you to keep tapping to the beat? Sure, you can play this game without the help of the baseline to time your jumps, but why would you miss all the fun? We're going to give you a few treble tapping tips and strategies that will keep your fingers and feet moving. How do I play Geometry Dash Lite? Select your colors and get tapping. 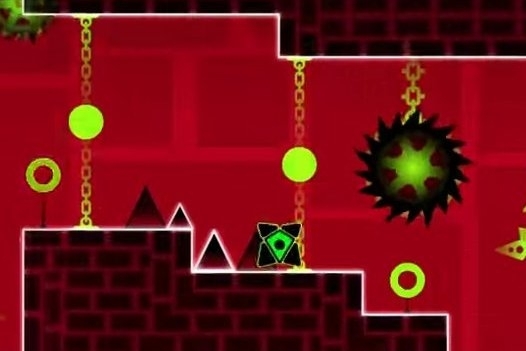 Tap to avoid obstacles within this 2D platformer by timing your taps to the beat. Timing is everything, so pay attention to what you see and hear. Prepare to dodge upcoming obstacles by repeatedly timing your jumps in sync with the beat. Use short and measured taps so you can get into a rhythm while at the same time avoiding spikes, booster pads and pitfalls. Ideally, you should only tap as needed to clear an obstacle. The level is complete when you clear the level and finish the song. What are the different challenges in Geometry Dash Lite? Geometry Dash Lite enables gamers to sample six bass thumping tracks that offer a variety of gameplay elements from booster pads, platform voids and emerging platforms. Navigate your way through these platform stages to progress to rocket mode, which gives you a break from the challenging platforming to a Flappy Bird style of play. How do I unlock colors and icons Geometry Dash Lite? â¨Persistence is key to unlock new colors and icons for your square and rocket within the game. Completing the levels will unlock new icons and will allow you to keep unlocking the colors. You can interchange colors with icons to create a new look for your square. Alternate colors give your Rocket a coat of paint. Do I need to pay for anything in Geometry Dash Lite? It's free to download, and while most of these features are stripped, you can still play through six stages and enjoy yourself. Check it out before paying for the full version, which is $1.99 and includes extra characters, a level editor and additional soundtrack tunes.